IAB’s restoration journey has taken a turn towards Rajasthan where we came across the collection of Devashish Jethwani, an avid collector of retro motorcycles and cars from Kota. The bike you in the images is a Jawa 250 type 559 that was made in 1973. This Jawa also graced the 2018 Auto Expo in Greater Noida, and now we have some beautiful images of the motorcycle with the picturesque backdrop of Rajasthan. Zishan Pathan captured the retro charm of the Jawa with the character-filled architecture of the state. 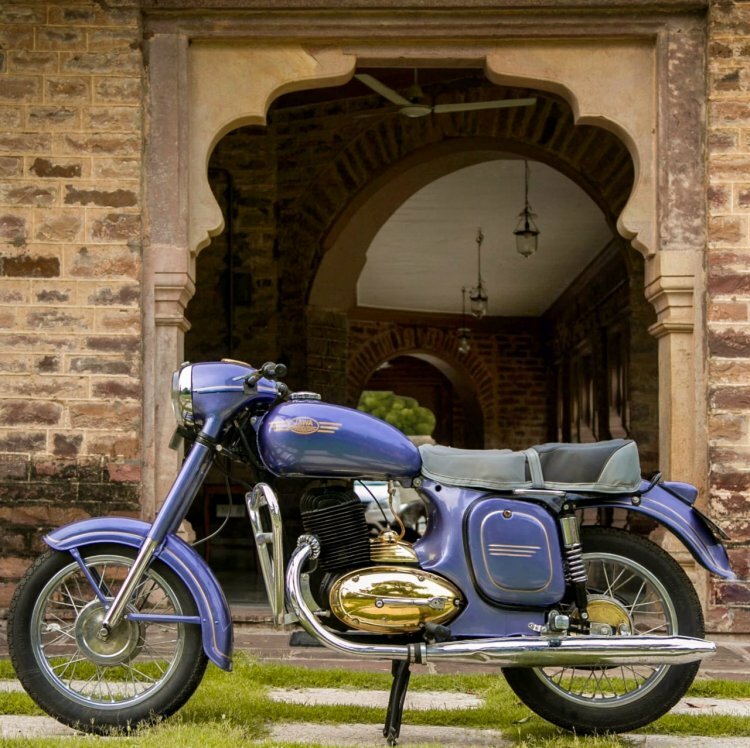 Devashish Jethwani, an avid collector of retro motorcycles and cars from Kota, Rajasthan purchased the Jawa 250 Type 559 and spent 11 months restoring the motorcycle. Devashish’s friend spotted the motorcycle in a scrap yard in Nagpur, Maharashtra. It began its long journey to Rajasthan where Devashish was ready to give the motorcycle the much-needed care. The restoration process was long, and it took as much as 11 months for the Jawa to turn into what it looks like in the photographs. 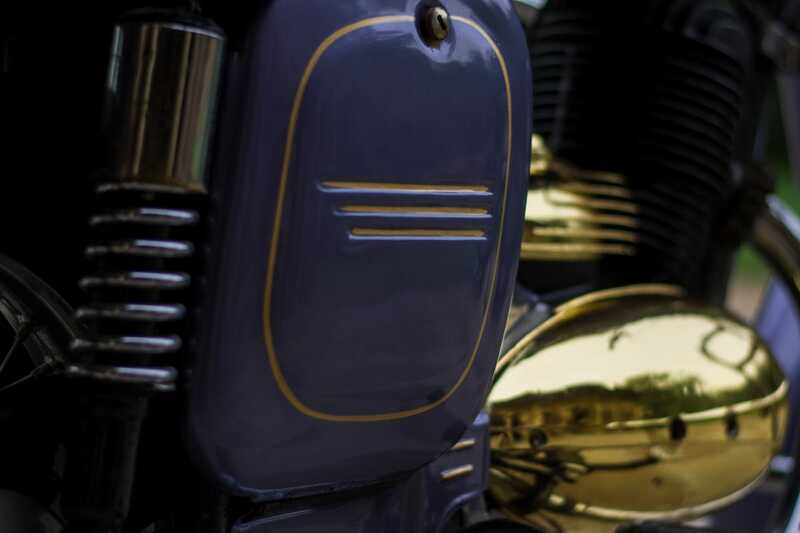 Hand-painted golden stripes across the body panels complement the fresh paint theme on the Jawa. The golden lines are visible on the front and rear fender, panel around the instrument console, fuel tank and on the side panels. The golden colour for the engine cover gives this Jawa 250 a unique and appealing look. Loads of chrome ensures that the motorcycle has a retro look from the past. Chrome finished parts on the Jawa 250 in the photographs include headlight mask, fuel filler cap, crash guards, exhaust pipes and the wheels. A grab rail for the pillion rider has been installed on the left side of the seat. The cockpit continues to use a single-pod dial that displays the speedometer and the odometer while the visuals are enhanced with a golden finish to the ring around the meter. The fading logo on the clutch lever and the retro-style handlebar grips add a nostalgic feel to a neatly done restoration job. In case you're curious to know the mechanical specifications, the 250 cc, single-cylinder, air-cooled, two-stroke motor on the Jawa delivers 14 hp of power at 4,750 rpm and 21 Nm of peak torque at 3,500 revs. The engine comes paired with a four-speed transmission. Golden stripes on various panels and a golden coloured cover for the engine adds an even appealing look to the retro package. Devashish’s Jawa 250 is one of the most beautiful restoration jobs that we have seen, and the neatly shot photographs capture the motorcycle in the best way possible. Don’t forget to check out a detailed image gallery below. Own a classic? Write to suvil@indianautosblog.com with pictures and details.